I imagine that in the future, we will have all kinds of new social issues. I knew that I wanted to draw robots today, so I did a little reading. After a few minutes of exploring some ideas and web-pages, I somehow came upon the EATR, or the Energetically Autonomous Tactical Robot. Obviously EATR is a backronym... and a creepy one at that. This EATR robot would be able to run indefinitely on organic matter that it collects, such a grass and flowers. The problem is when there is no grass, flowers or anything organic...except for you. You are an organic matter and this EATR is hungry. The robot must now choose between your life and it's own. We all hope that it chooses to sacrifice it's own life for you, in which case an emotional tear may streak down your face as the EATR shuts down; however, if the robot chooses life, it could mean your death! This is where the robot ethics would come into play. Ethical decisions are going to have to be programed into these robots. We all know that there are going to be many issues, because that is how us humans are...we have issues. 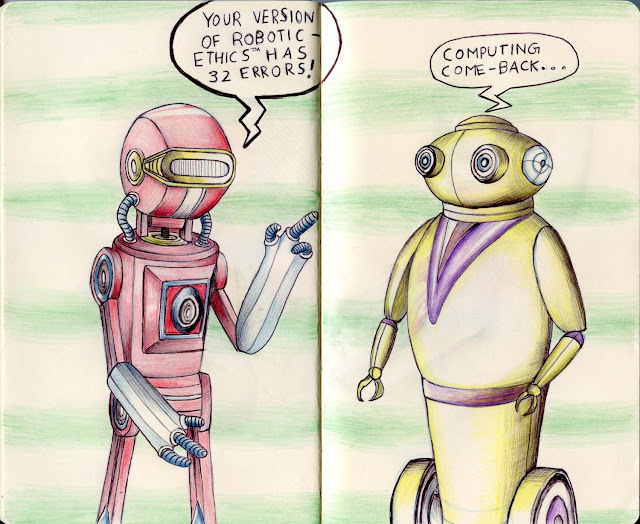 Every time a new issue pops up, we'll have to reprogram all these robots, so that we can patch up the new loop-holes. Eventually, there will be out-dated robots living underground or in the forest, who may indeed be very dangerous. I think it is very funny, yet equally creepy. This article from Wired.com didn't help.